(Muse) (In Greek and Roman mythology) each of nine goddesses, the daughters of Zeus and Mnemosyne, who preside over the arts and sciences. In the creative industries, it is vitally important to always be inspired for each and every project you take on and fashion photographer Tim Walker has turned film director to explore this theme further. His piece, simply titled ‘The Muse’ features Ben Wishaw in the leading role, who rose to fame in 2012 after playing James Bond’s go-to-gadget-guru Q in Skyfall. He plays struggling artist Edward who is lost without his muse (Kristen McMenamy), and left to reflect over what he had, mourning his source of invention and imagination. It is refreshing to watch Walker liberated from still photography to work with the moving image, and his strong visual style transfers beautifully across mediums. Each frame of the film is deliberated over and could easily be captured to go on display. Structurally, the minimalist narrative floats through in a wash of ambiguity, as Edward mopes about in despair, his internal monologue the only dialogue, while his mermaid muse gazes out of a water-tank in what are beguilingly fantastical-flashback-dream sequences. I feel that it could benefit from the accompaniment of an exhibition space to fully flesh out the thought process involved, but with the behind-the-scenes bundle available at www.wearecolony.com, you can get access to the full film as well as stills, concept art, sketches and more! 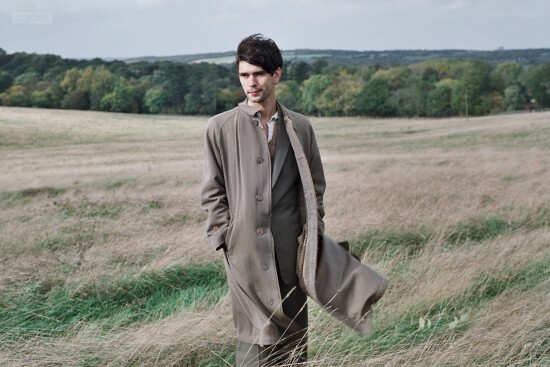 This entry was posted in Shorts and tagged ben wishaw, the muse, tim walker, we are colony. Bookmark the permalink.